On Thursday, May 28, Moxie Realty Group LLC, along with co-hosts TreeHouse, Austin Title, and Austin Inspection Services bring you an evening of the truth about what to expect when you buy a property and fix it up. This is the second time this year Moxie has worked to provide a great forum for learning about the pitfalls, plateaus, and pinnacles of fixing up a property. From finding a property, to getting financing, to getting the work done—this candid group of professionals, including a renovation financing expert, will provide information and answer questions about what it takes. The renovation loan specialist will share important financial considerations and timelines. Whether you want to buy a fixer for your own home, or as an investment, there is a renovation product available for you. One of the great things about fixing up a home is that you can make some truly eco-friendly decisions, and have a chance to put your own stamp on your home. There is nothing like having the freedom—whether your style is minimalist or over-the-top. Kneeland’s home “office,” which she calls her “Chinese jewel box,” features red lacquered cabinets and a black chandelier she brought back from a trip to Amsterdam and beautiful light fixtures she shipped from a trip to Marrakech. What: So . 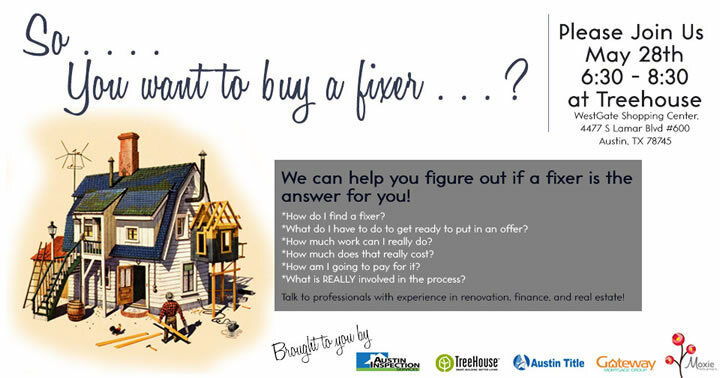 . . You want to buy a fixer? When: May 28, 2015, 6:30 p.m. to 8:00 p.m.
© 2004-2019 Texas-Press-Release.com. Part of EPR-Network.com. Owned by EPR Network LLC. All Rights Reserved. All trade marks and names are owned by their respective owners.